Night sky watcher David Kingham took this photo of the Perseid meteor shower from Snowy Range in Wyoming on August 12, 2012. As 2012 comes to a close, some might wonder what is looming sky-wise for 2013.What celestial events might we look forward to seeing? I’ve selected what I consider the top 13"skylights" (get it?) for the coming year, and have listed them in chronological order. Not all these night sky events will be visible from any one locality (you may have to travel to catch all the eclipses), but you can observe many of them from the comfort of your backyard, weather permitting. The next year also promises two potentially bright comets: PANSTARRS and ISON. As any astronomer can tell you, comets are notoriously capricious; we can only guess at how bright they will get and how long their respective tails will be. We’ll just have to wait and see. Jupiter shines bright near a halo-wrapped moon in this amazing photo by stargazer Hunter Davis of Durango, Colo., on Dec. 25, 2012. Mercury, the "elusive" innermost planet, will travel far enough from the glare of the sun to be readily visible in the western sky, soon after sunset. On the evening of Feb. 8, Mercury will skim within less than 0.4 degrees of the much-fainter planet, Mars. Discovery image of the newfound comet C/2011 L4 (PANSTARRS), taken by Hawaii's Pan-STARRS 1 telescope. March 10 to 24: Comet PANSTARRS at Its Best! Comet PANSTARRS, discovered in June 2011 using the Pan-STARRS 1 Telescope at Haleakala, Hawaii, is expected to put on its best show during this two-week period. During this time, the comet will also be near its closest approaches to the sun (28 million miles, or 45 million kilometers) and Earth (102 million miles, or 164 million km). While Comet PANSTARRS was a very dim and distant object at the time of its discovery, it has brightened steadily since then. It still appears on target to reach at least first magnitude and should be visible low in the west-northwest sky shortly after sunset. On the evening of March 12, the comet will be situated 4 degrees to the right of an exceedingly thin crescent moon. This will be a very minor partial lunar eclipse, with the moon's uppermost limb merely grazing the Earth's dark, umbral shadow. At mid-eclipse, less than 2 percent of the moon's diameter will be inside the dark shadow. The Eastern Hemisphere (Europe, Africa, Australia and most of Asia) will have the best view. This lunar eclipse will not be visible from North America. During annular solar eclipse (also known as a "Ring of Fire" eclipse), the long, umbral shadow cone of the moon is too short to reach the Earth. In angular size, the moon's disk appears about 4.5 percent smaller than the disk of the sun. So, the effect is like placing a penny atop a nickel: a ring of sunlight remains visible surrounding the moon. The shadow path from where the ring can be seen runs for thousands of miles, but will get no wider than 107 miles (172 km) at the point of greatest eclipse. Much of the path falls over the Pacific Ocean, but at or soon after local sunrise, it will slice across a part of northern Australia (where it will be the morning of May 10) and the extreme eastern tip of Papua New Guinea, along with some of the nearby Solomon Islands. At the point of greatest eclipse, the ring phase will last 6 minutes, 4 seconds. Hawaiians will see a partial eclipse when, at 3:48 p.m. Hawaii time, the moon will obscure about 32 percent of the sun's disk. Mercury, Venus and Jupiter will provide a fascinating show low in the west-northwest twilight sky soon after sunset. They will seemingly shuffle around each other, changing their positions noticeably from one evening to the next. The two brightest planets, Venus and Jupiter,will be separated by just over 1 degree on May 28, with Venus passing to the northwest (upper right) of Jupiter and shining more than six times brighter than Jupiter. On June 23, the moon turns full at 7:32 a.m. EDT(1132 GMT),and just 32 minutes earlier it will arrive at its closest point to the Earth in 2013 at a distance of 221,824 miles (356,991 km), making it a so-called supermoon.Expect a large range in ocean tides (exceptionally low to exceptionally high) for the next few days. 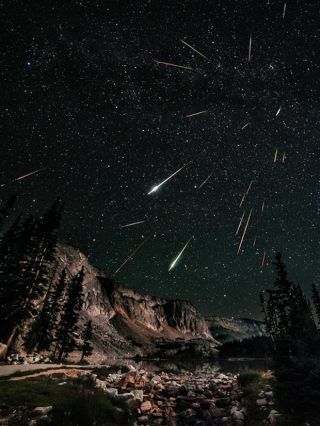 The annual Perseid meteor shower is considered among the best of the annual displays thanks to its high rates of up to 90-meteors-per-hour for a single observer, as well as its reliability. The shower is beloved by summer campers and often discovered by city dwellers who might be spending time in the country under dark, starry skies. This past summer, the moon was a fat waning crescent and presented a minor nuisance during the meteor shower. But in 2013, the moon will be a couple of days before first quarter and will set during the evening hours, leaving the rest of the night dark for prospective observers. Photographer Jeff Rose captured this amazing photo of a Perseid meteor and the bright moon just after 1 a.m. on Aug. 11 during the 2012 from Cave City, Arkansas, during the 2012 Perseid meteor shower peak. The moon slides through the northern part of the Earth's penumbral shadow during this lunar eclipse event. At mid-eclipse, 76 percent of the moon's diameter will be immersed in the penumbra, probably deep enough to cause a faint, yet discernible darkening of the moon's lower limb. The region of visibility includes much of Asia, Europe and Africa. The central and eastern portion of North America will get a view of the slightly darkened Hunters' Moon during the early evening hours. This is a rather unusual solar eclipse in that, along its track, which runs for 8,450 miles (13,600 km) across the Earth's surface, the eclipse quickly morphs from annular to total; it is therefore known to astronomers as a "hybrid eclipse." Truth be told, along most of the track, the eclipse appears as a total, with a very thin annulus (or ring) of sunlight visible near the very beginning of the track. The track of the central line of this eclipse begins in the Atlantic about 545 miles (875 km)southwest of Bermuda. So, along North America's Atlantic Coast, interested viewers (using proper viewing devices, such as pinhole projection or #14 welders glass) will only see the dark disk of the moon exiting the sun's face at sunrise. The eclipse track will pass south of the Cape Verde Islands, then curve southeastward parallel to the African coastline. The greatest eclipse, with 100 seconds of totality and the path width reaching a maximum of just 36 miles (58 km), occurs approximately 250 miles (402 km) off the coast of Liberia. The shadow track will then sweep across central Africa, passing over sections of Gabon, Congo, Democratic Republic of the Congo, Uganda and Kenya, before ending at sunset at the Ethiopia-Somalia border. This image shows the newfound comet C/2012 (ISON) as seen by the Remanzacco Observatory in Italy. The image, taken by amateur astronomers Ernesto Guido, Giovanni Sostero and Nick Howes, is a confirmation view of the comet, which was first discovered by Vitali Nevski (Vitebsk, Belarus) and Artyom Novichonok (Kondopoga, Russia). Image released Sept. 24, 2012. On Sep. 21, 2012, two amateur astronomers (Vitali Nevski of Belarus and Artyom Novichonok of Russia)used a telescope owned by the International Scientific Optical Network to discover a new comet that was christened using the acronym of the instrument used to find it: Comet ISON. Orbital calculations indicate that comet ISON will travel closest to the sun, less than 750,000 miles (1.2 million km) above the sun's surface, making it a true "sungrazer," on Nov. 28 (Thanksgiving Day in the United States). The comet could eventually be bright enough to be visible in broad daylight around the time of its nearest approach to the sun. It will then travel toward Earth, passing within 40 million miles (64 million km) of our planet a month later. Since comet ISON will become very well placed for viewing in the morning and evening sky from the Northern Hemisphere during the following weeks, it could become one of the most watched comets of all time. Venus, the brightest of all the planets, puts on a holiday show all month long, and what a spectacular one it is! Venus is the showiest it will be for all of 2013 and 2014 either in the evening or morning sky. It adorns the southwestern evening sky as much as three hours after sundown at the beginning of the month, and 1.5 hours after sundown by New Year's Eve. A lovely, crescent moon passes well above and to the right of the planeton Dec. 5, and the next night Venus will reach the pinnacle of its brilliance; Venus won’t be as bright an "evening star" again until 2021. If there is one meteor display guaranteed to put on a very entertaining show, it is the Geminid meteor shower. Most meteor experts now place it at the top of the list, as it surpasses in brilliance and reliability even August's Perseids. Unfortunately, in 2013, the moon will be several days before full phase and will light up the sky for much of the night, hiding many of the fainter meteors. But around 4:30 a.m. (your local time), the moon will have finally set, leaving the sky completely dark for about an hour. That will be your chance to make as many as two meteor sightings per minute, or 120 per hour!